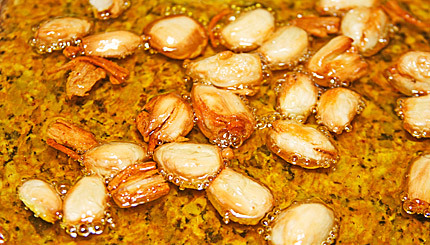 A quick method for producing both cloves of roasted garlic and garlic oil for dipping breads. Garlic flavor is heavily influenced by the amount of air the raw cloves are exposed to. Roasting the whole garlic bulb produces cloves with a warm, rounded garlic flavor that is more soft and subtle than the sharpness of chopped or minced garlic. See below for a method of doing larger batches of garlic oil. Preheat your oven or toaster oven to 400°F to roast the garlic head. Slice the top off a head of garlic so that most of the large cloves within show an exposed upper surface. Place the clove of garlic in a small oven-safe dish. I use small Pyrex 6 ounce (175 ml) clear glass bowls for this purpose. You can find them in any kitchen supply store and in most supermarkets, and the bowls hold a large head of garlic perfectly for roasting. 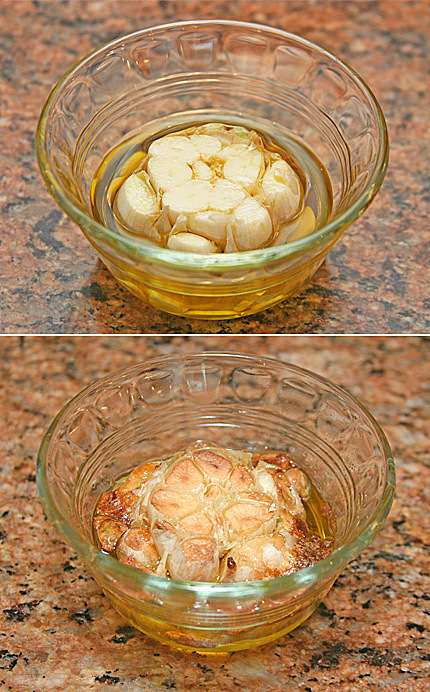 Pour the olive oil over the head of garlic, being particularly sure to drench all the exposed clove surfaces with oil. As the olive oil runs off the head it will form a pool around the head, but be sure to leave the cut surface of the bulb exposed above the surface of the oil to get a nice browned crust on the cloves. Place the dish and garlic head into the oven and roast it for about 30 minutes, until the surface of the cloves is a golden brown. 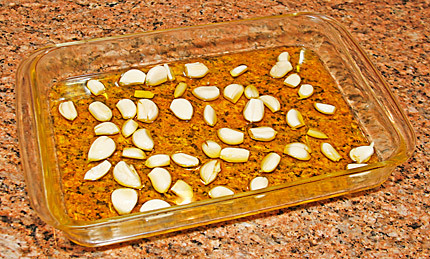 Remove the garlic head from the oven and, with a fork, remove the garlic head from the glass dish and set it on a plate to cool. Allow it to cool about 15 minutes, until you can handle it comfortably. Use a small paring knife to pop the roasted cloves out of the head of garlic. Use the oil and cloves within a day or two. Don’t store homemade garlic oil or cloves. Commercial garlic oils are specially filtered and processed for storage. For larger batches of garlic oil, use a baking pan or dish and spread out a suitable number of whole cloves of garlic. The exact number of cloves or precise amount of oil doesn’t matter. Scatter the pan with cloves, then add extra virgin olive oil until the larger cloves are about half-submerged by the oil. Stir the cloves to make sure they are all coated with oil. You want to leave the upper part of the clove exposed to the oven heat to get a nice roasted taste. Here I have used about 45 cloves of garlic, and a little less than a quart of olive oil, in a 13 x 9 inch (33 x 23 cm) Pyrex baking dish. Making your own garlic oil gives you a much stronger garlic taste than almost all commercial garlic oils, and allows you to choose how much roasted effect you want with your oil. I like the rich golden color and flavor of brown-roasted cloves, but if you prefer a milder effect, just shorten the roasting time by 10-15 minutes. Place the baking dish and garlic head into the oven and roast for about 30 minutes, until the edges of the cloves are a golden brown. Remove the dish from the oven and allow the dish and oil to cool for about 15 minutes, or until you can handle the dish and oil safely. Always treat homemade flavored oils as perishable items, and store large batches in the refrigerator. Homemade oils are not processed for shelf stability like commercial bottled garlic oils, and may go rancid if you leave them out for days at a time. I prefer the strong taste of brown-roasted cloves. Here they are still sizzling in the oil on the counter top as they cool. 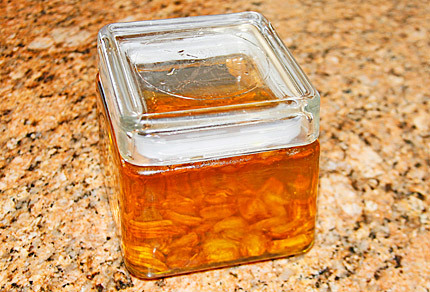 Jar of finished roasted garlic oil. Keep refrigerated between uses. Once they have cooled, pour the oil and cloves into a suitable container, and store what you won’t use immediately in the refrigerator to keep the oil and roasted cloves from spoiling.